The Philadelphia District Attorney's Office said Wednesday that it would not oppose Meek Mill's release from prison on bail because it has questions about whether the rapper's conviction from a decade ago would withstand his most recent appeal efforts. In a motion filed in Common Pleas Court, prosecutors said, "There is a strong showing of likelihood of [Mill's] conviction being reversed," based on allegations that the 2008 conviction was secured thanks to false testimony by arresting officer Reginald V. Graham. Prosecutors also cited the fact that Graham — the sole government witness at Mill's trial — was included on a recently disclosed list of police whom the District Attorney's Office had deemed too untrustworthy to testify. "In the event [Mill's] conviction is reversed … the risk of an unjust or disproportionate sentence having been served exists," said the motion, filed in response to an appeal by Mill's attorneys. "That risk increases as long as [Mill] remains in custody." The filing delivered Mill the most tangible reason for optimism yet in his four-month quest to secure his release, and it offered the first indication that he may have a powerful new ally in District Attorney Larry Krasner, a self-styled reformer who was sworn into office in January. Still, Mill's freedom is by no means assured. The decision lies with the judge who imprisoned him, Common Pleas Court Judge Genece E. Brinkley, whom the rapper's backers have spent months attacking with accusations of ethical improprieties while petitioning the court to have her removed from the case. Mill's attorneys, Joe Tacopina and Brian McMonagle, said they were pleased with Krasner's motion and hoped it might soon trigger Mill's release. Mill's mother, Kathy Williams, who had spoken tearfully at an event supporting Mill the previous day at the University of Pennsylvania, said in a statement Wednesday: "I pray that God gives Judge Brinkley the wisdom to make the right decision and allow my son to return home to his family." Mill, whose legal name is Robert Rihmeek Williams, has been incarcerated since Brinkley sentenced him in November to two to four years for violating the terms of his probation from the 2008 drug and gun conviction. 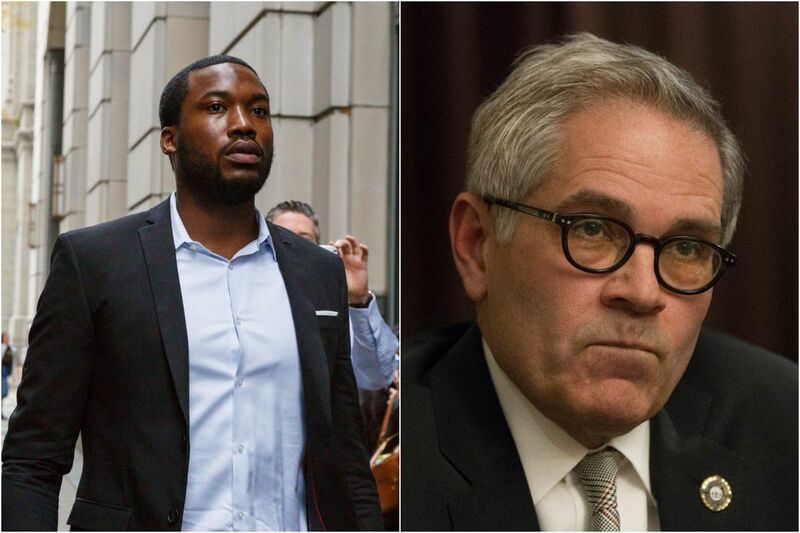 The judge's decision ran counter to recommendations from prosecutors and the rapper's probation officer at the time — and it immediately sparked a wave of public backlash, with athletes and celebrities joining fans and activists in calling the sentence overly harsh. In the four months since Mill, 30, was sentenced, the District Attorney's Office has taken no position on repeated requests from his lawyers to free him while he appeals the sentence. Krasner's filing Wednesday took a slightly stronger stance, saying prosecutors would not oppose Mill's bail request. In efforts in and out of court to secure his release, Mill's legal team has targeted Brinkley, the probation sentence, and the legality of his original conviction. The focus has shifted in the last month toward his 2008 trial, as lawyers have accused Graham of lying under oath to ensure that Mill was put behind bars. They also lined up another retired narcotics officer, Jerold Gibson, who in sworn statements has said he can back up that claim. Gibson also has agreed with Mill's contention that Graham and other officers beat him during his arrest. Mill's lawyers also included a sworn statement from another ex-officer, Jeffrey Walker, who has accused Graham of stealing money during unrelated drug arrests in 2005. Both Gibson and Walker face potential credibility issues of their own — a situation prosecutors highlighted in their filing Wednesday while discussing the difficulty of evaluating their claims. Gibson, former son-in-law of former Gov. Tom Corbett, was fired from the Police Department in 2013 and later sentenced to six months to a year in jail, after he was caught in an FBI sting stealing from suspected drug dealers. Walker pleaded guilty to similar federal theft charges in 2014 and later served as the government's star witness in a case against six of his former colleagues on a police narcotics field unit. The jury, in acquitting those officers in 2015, largely rejected his testimony. Still, federal prosecutors stand by Walker's account. His past testimony has also factored into court rulings overturning hundreds of convictions tied to the unit's past arrests as well as the city's decision to dole out millions to settle lawsuits stemming from the officers' conduct — a fact that prosecutors noted in their motion Wednesday. While saying they were "not in a position to accept or reject the allegations" made by Gibson or Walker, prosecutors said the officers' claims represented "new and important information relating to the integrity of the original conviction" — information that was not known at the time of Mill's trial or subsequent court proceedings, including his sentencing in the fall. They also cited the fact that Graham later was placed on a list of so-called untrustworthy cops — a list developed under former District Attorney Seth Williams but not disclosed to defense attorneys until last month. Graham's inclusion on the list did not relate to Mill's case — it was over unrelated corruption allegations — but prosecutors noted that once he was added to it, the District Attorney's Office did not notify Mill's lawyers during any of the several probation hearings in the months after. It was not immediately clear how Brinkley might react to the filing. Due to judicial conduct rules, she is barred from commenting on cases in which she is presiding. A hearing is scheduled for April 16 to consider Mill's latest appeal. He remains incarcerated at a state prison in Chester.